Yu Jump in Palm Bay is the ultimate indoor play place to bring your kids! We offer the largest indoor Yu Kids indoor playground in the states. Your kids will love playing at Yu Jump and the variety of activities we have to offer. 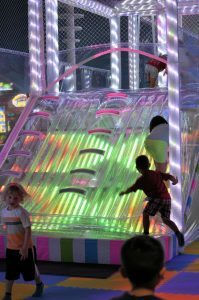 Our indoor playground includes four jumps and slides, and a 20-foot high slide, a dance party dome, arcade games, and so much more! Whether you stop in to play for a few hours or you plan your child’s birthday party at our indoor playground, you and your kids will love everything we have to offer! At Yu Jump in Palm Bay, we offer different bonuses with each admission. Be sure to check out our hours of operation to learn more about when we are open and what bonuses you can get with each admission! We also have different events happening at our inflatable play place weekly! From pizza nights to half-price admission, these events can help make having fun at Yu Jump better for everyone, including parents! This is the perfect place to visit on weekends or during the summer to get your kids out of the house and active. Yu Jump also does birthday parties! If you want to plan the ultimate birthday party for your child, be sure to check out Yu Jump parties! We offer different party packages that allow for you to plan the best birthday. Our party packages can make your child’s birthday better than you ever expected! Birthday parties at Yu Jump are fun for all kids and easy for parents! You can learn more about our parties and book your party online! Whether you are stopping by Yu Jump with your kids on the weekend or you are planning your child’s next birthday party at our inflatable play place, we promise you will love every minute of it! Learn more about our VIP cards, fill out our Yu Jump waivers before dropping by, and contact us with any questions you may have! Your kids will love the time they spend playing on the inflatables at Yu Jump in Palm Bay.